The light bulb ban is bringing energy efficient bulbs, such as LEDs, to the forefront. While this is ruffling the feathers of those not eager to give up the traditional incandescent bulb quite yet, we’ve composed a list of some things that will make the transition to LED lighting as seamless as possible. Dimmability: Another great way to save on your energy costs is dimming your lights. Dimmers are great for two reasons: they reduce your energy consumption and extend the life of your bulb, and they can set the perfect mood during dinner or watching a movie. While incandescent bulbs change color as they dim, most LEDs don’t. They simply dim by reducing their brightness while maintaining the same color. Before you buy a dimmer, make sure your LED bulbs are dimmable and your bulbs are compatible with your dimmer. Color Rendering Index (CRI): You may have never heard of CRI before today, but it’s still a really important factor when deciding on your bulbs. Color rendering index is a measure of how accurately a bulb renders colors in relation to the sun, which has a CRI of 100. Why is CRI important? The higher a bulb’s CRI, the better colors will look. Colors will look more vibrant and richer, which you’ll be able to notice in areas such as the kitchen and in the closet. The lower the CRI, the worse colors will look, as they’ll appear washed up and even yellow. Incandescent bulbs have a CRI of 100, meaning they render colors just as accurately as the sun. LED bulbs don’t have a CRI as high as that of an incandescent bulb, but they come fairly close. A good number to use as a reference for CRI is 85, which is a very good color rendering. For an example of CRI in action, click here. Color Temperature: Before we dive into color temperature, let me first start by saying that color temperature has nothing to do with ambient temperature. Now that that’s settled, color temperature refers to the actual color of the light that’s produced. The lower the numbers, the yellower the light and the higher the numbers, the whiter the light. The warm white scale runs from 2400 Kelvin to 3000 Kelvin, while cool white runs from 4000 Kelvin to 4100 Kelvin and stark white ranging from 5000 Kelvin to 6500 Kelvin. So which color temperature do you pick? That’s purely up to you. Most people will use warm white bulbs to create a cozy, homely feeling throughout the home, and maybe use a cool white bulb in the kitchen. You probably won’t see too many homes with cool white bulbs in them, as these are typically used in hospitals and in businesses. Light Output: For incandescent bulbs, the higher the wattage, the brighter the bulb (measured in lumens). While that’s accurate for incandescent bulbs, that’s not quite the case for LEDs, as LED bulbs require the use of far less wattage to achieve the same effect as incandescent bulbs. For example, a 60-watt incandescent bulb produces 800 lumens, but it may take only 8, 12, or 14 watts for an LED bulb to produce the same amount of lumens. In other words, you want to choose your bulb based on the amount of lumens it produces, not on the wattage it consumes. 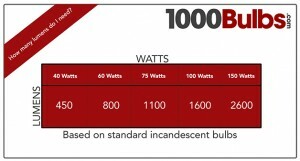 The chart on the right will give you a breakdown of the lumen output of standard incandescent bulbs. It’s a good idea to write down these outputs before you go shopping for LEDs, as the product descriptions and labels may not have this information on them. Price: Easily the biggest objection people have with LEDs is price, which is understandable. While prices are coming down, the upfront cost of this new technology can be a little hard to swallow. However, think of it like this: the initial cost of LEDs will be quickly offset by their longevity and the fact they use substantially less energy than incandescents. Also, you’ll see paybacks on your investments within 12 to 18 months. Not to mention that some LEDs last up to 50,000 hours, while the standard incandescent, while a fraction of the cost of an LED bulb, lasts only about 1,200 hours. What are some things that will impact your LED buying decisions? Tell us in the comments below, or give us a shout on Twitter, Facebook, Google Plus, or Pinterest! Jan 8 Which Bulbs Are Exempt from the Light Bulb Ban?